Have I ever told you about my history with Harry Potter? I was thirteen when the first book came out (in the U.S.). Growing up in a little, rural town in Colorado (and being homeschooled on top of that), I don't know when I would have heard about it enough to take notice of it if not for my grandma who enjoyed it immensely and told my family to read it. So I did, and I remember loving every minute of it. By the time I read the first, I think the second one was already out, so I devoured it as well. And then I waited with great anticipation for the third. If I remember correctly, I think I even had to put my name on a waiting list at our little library (which I don't think I'd ever had to do before). It was about that time that my mom began to get a little worried that the series seemed to be getting darker with each book. She was concerned about where it was going to end up. And so, after I read the third, I took a break and never returned to the series. To this day, I've still only read the first three. Some of you are probably wondering how I could leave it so easily, but fantasy has never been my favorite genre and each book was more heavily saturated with fantasy elements, and so it wasn't that hard for me to just move onto other books. Anyway, for years, I've meant to read the entire series, but it seemed like such a huge time commitment (those of you who have read the series at least a dozen times are probably balking at the notion that I would have to "force" myself to read them). I finally just decided to begin back at the beginning and read the first one aloud to Aaron and Maxwell. Almost all of Aaron's friends at school have read at least the first one, and I thought he might be missing out on some cultural references by not being familiar with Harry Potter jargon. However bland my motives for reading it may have been, I can tell you this: it is one of the best readalouds we've read. The pull of the story that I remember so well from my own childhood was still there, and I don't think we ever closed it for the night actually wanting a break from it. I know you don't need a summary (at age 11, orphan Harry Potter is summoned to Hogwarts School of Witchcraft and Wizardry. He finally learns the truth about what happened to his parents and bravely attempts to protect a life-giving stone that is being hidden at the school), so I'll just cut right to our impressions of it: we loved it, loved it, loved it. Maxwell was so funny when I first pulled it out and said that it would be our next readaloud. "No way," he said. "I don't want to listen to it." And he actually left the room to go listen to what Mike was reading to Bradley. But after a little cajoling, I convinced him to listen to the first chapter, and then he was hooked. At the end of every chapter, he would beg, "Just one more! How about one more page? Or one more word?" He laughed every time he remembered how he almost missed out on one of his favorite books ever (I can't even count the number of times he's listened to the audio in the last three weeks). But the last two chapters were the best. We read them on a blissfully uncluttered afternoon. You remember how the second-to-last chapter ends, right? "There was already someone there--but it wasn't Snape. It wasn't even Voldemort." My kids burst out with, "WHAT?! Who was it?!" I said, "Well, that's the end of the chapter" and began to close the book. There was a major protest, and I was so glad we were reading it at a time when we actually could go on, right then, and have our curiosity satisfied. But before we turned the page, we all took guesses about who was really in the room. And of course, neither of them even gave a thought to Quirrell, which made the turning of the page that much more exciting. Then of course there was the thrill of watching Harry defeat Quirrell and the final wrap-up of the first year at Hogwarts (my personal favorite part was when Neville was awarded ten points, and it was those ten points that tipped the scale in Gryffindor's favor--I'd totally forgotten about that). It really was such a perfect way to spend an afternoon. My mom has been telling me to read this book for years. It's one that I never heard growing up, but she read it to my younger siblings, and they all loved it. I've always had it in my head that it would make a good October read (and although it is winter for most of the book, the Gothic ambiance definitely makes it feel like it belongs to this time of year), and so it was on the short list for this month. Bonnie Green is the only child of Sir Willoughby and Lady Green. They make their home at Willoughby Chase, an imposing and very comfortable estate (in the middle of nowhere and surrounded by starving wolves--not exactly its best selling points). Lady Green's health is poor, and so she and Sir Willoughby are leaving for a warmer climate for a few months, but Bonnie is staying behind. She doesn't mind; her cousin, Sylvia, is coming to stay with her, and her father has asked his distant cousin, Miss Slighcarp, to come be their governess while they are away. But they are no more than a day's journey out of sight before things begin to go drastically wrong. Miss Slighcarp has no intention of being the girls' governess and instead has plans to take over the estate. She soon realizes Bonnie and Sylvia are in the way too much and sends them to live at Mrs. Brisket's boarding school (more like a prison than a school). Bonnie and Sylvia are miserable there, but Bonnie's spunky spirit is indomitable, and she soon thinks up a plan of escape. The book reminded me a lot of Nancy and Plum, which we read last year, and which also features two little girls who are under the jurisdiction of an evil headmistress. I'd say this one is for slightly older children. The language is more complex (in the first chapter alone, we encountered the words "portmanteau," "goffering," "fowling piece," "hoydenish," "chatelaine," "oubliette," and "pelisse"), and the setting is a little more dismal and dire. I thought my kids might get tripped up by all the unfamiliar words (I certainly was tripping over them in my attempts to pronounce them), but the thing I'm quickly discovering as we read more and more challenging books is that they really don't focus on what they don't know (most of the words could be discerned from the context, and for the other ones, it was easy to stop and take a moment to define them) but on the story overall. On the whole, we loved the book. There's just something about outwitting an evil governess that totally makes your day. This is exactly the kind of book I would have adored as a little girl. Bonnie and Sylvia are great counterparts to each other (brave and impetuous vs. cautious and attentive), and both of them are so kind to each other (although Bonnie does come off as a trifle spoiled). We stayed up late one evening to finish it (a decision I definitely regretted the next morning in the face of irrational children), but it was such a dramatic conclusion, there was no way we could stop in the middle of it. This is apparently the first book in a long series. My mom said they tried a couple of the following ones and weren't as enamored with them. Has anyone else gone on with the series? Thoughts? Opinions? I found this book waiting for me on my hold shelf at the library one afternoon, and it baffled me because I hadn't the faintest recollection of requesting it. I think I must have heard about it on Instagram and asked for it right away and then had to wait for it for a couple of weeks, which gave me plenty of time to forget about it. Still, it's just a little eerie to go the library and find a totally unfamiliar book with your name on it. Especially when that book is about a little witch who practices some small magic (like perhaps reserving her book for an unsuspecting (but very regular) library visitor?). Anyway, unfamiliar or not, it looked like a cute little book, so we read it. And I'm glad we did. It was short, very sweet, and even Bradley listened in on the entire thing. It is Halloween night. Lucinda has taken off her ghost costume and crawled into bed. She's already asleep when she's woken by a strange noise. She finds a little bedraggled witch whose broom broke as she was flying home. All of the other witches have gone, and she must get home before midnight or she'll be stuck there until next Halloween. Lucinda tries to help (even offering the vacuum cleaner), but the little witch just doesn't know enough magic yet to make it happen. And so Lucinda tells her she can stay with her family. 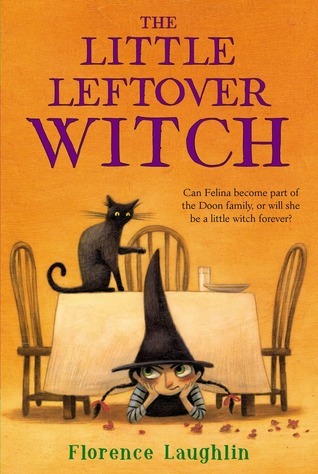 The little witch (whose name is Felina) is rude and uncooperative and only does the things she's supposed to when Lucinda's dad says, "that's an order." But Lucinda and her parents quickly grow to love her strange little ways, and gradually, she warms up to the family as well. As her heart softens, she knows she will do anything to stay with them forever. This was first published in 1960 (and then came back into print in 2013). There are little references here and there which date it (like when Lucinda's mother receives a record player for Christmas), but overall, it's just a great little story that seems to have lost none of its charm in the last fifty-five years. I will say that you do have to read between the lines a bit at the end of the book. If taken the way it was intended, then Felina is a lonely little girl who happily finds a family who adores her and wants to keep her forever. If taken the wrong way, it looks a little like she gives up her identity to conform to the Doon's expectations of what "normal" is. (Plus, there is a witch searching the skies for her towards the end of the book, but no one points this out to Felina, and a part of me wondered if there was a family on the other other side who wanted her back.) By all indications, Felina seems to have never experienced love or acceptance before living with the Doons, but I think you could interpret this story either way. I'm choosing to go with the way the author imagined it, but I can see some other readers taking fault with that aspect of the story. Overall though, it was just a really cute, imaginative little story. It would be the perfect thing for curling up with after you get home from trick-or-treating. What have you been reading to your kids this month? I love, love, love that part when Neville's points tip the scale. So glad you had a great experience reading the book. I am really looking forward to reading Harry Potter with my daughter. When do you think you'll start the series with your daughter? I debated about what the perfect age is, in part because I don't think I'll introduce the later books for a few years yet and am wondering if, now that we started, it's going to be hard to hold out. Can you believe I've never read HP? I keep meaning to, but I just never feel like I have the time to commit to it. 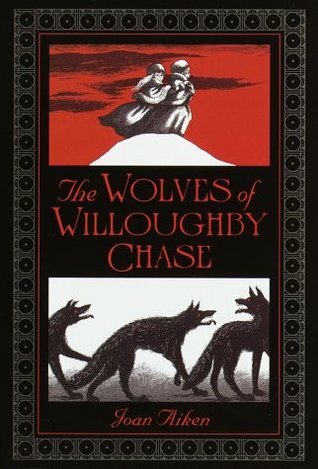 We read Wolves of Willoughby Chase a few years ago and enjoyed it, but my girls never seemed interested in going further. Thank you so much for participating in RAT! I know exactly what you mean. It's a huge time commitment, especially for those of us who don't *love* fantasy. Many of the rest of Aiken's Wolves books are about Dido Twite, who shows up in book 2. So you can try that, and if you like her keep going. She sails around a lot, which gives Aiken an excuse to set the books all over the world, which is fun for me, but not as immediate as the first one, which has such a strong sense of place. 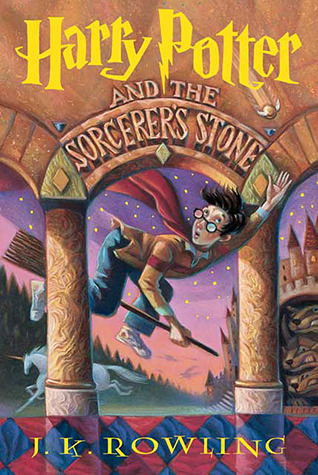 I loved reading the first three Harry Potter books to my sons, and the fourth one was OK, but then they started getting very long. Also, Harry is kind of a jerk in the fifth book, which is appropriate-- he's a fifteen year old boy with no family and the target of many bad people, but it made it less fun to read. I think we read the last few books during cosy family read time, but not out loud. Thanks for your insights into the rest of the Wolves Chronicles! I think we'll need to give the second one a try (although when?! I have so many books waiting in the wings for us--there's just not enough time!). That's a good point about HP. I've been trying to decide how to pace ourselves through the rest of the series, and maybe we'll eventually want to hand the books over to the boys to finish on their own (the length is a major determent since, as I said above, there are so many books I want to read to them and so I don't want to spend two months on just one book!). I love that you do cozy family read time. I tried that over the summer, and it wasn't what I had dreamed, but I think that's because my kids are still a little young. I loved the fact that the Harry Potter books were still coming out when I was growing up -- it was fun to grow with them, and I didn't have the opportunity to read the darker ones until I was older anyway. I'm wondering what we'll do when my son is old enough to enjoy them -- the early ones are great for pretty young kids, but they definitely get darker as they go on! Yes, I totally agree! It's kind of too bad they can't just release the series one book per year all over again. One of my friends saves HP for October only, so that is how they've paced themselves through the series and given their kids a chance to grow up a little.